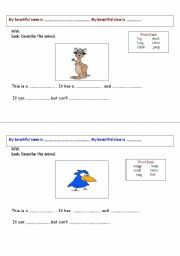 This W.sheet focus on the use of has in singular form and have for plural. 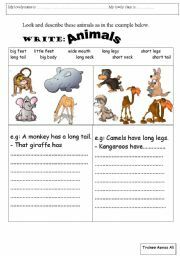 It gives a good practice in writing about animals´ description. 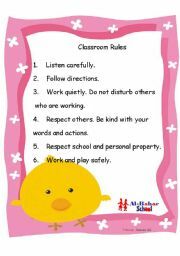 Rules to maintain safety and discipline in classroom. 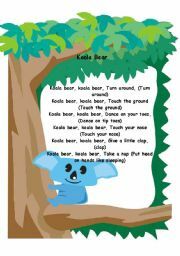 This is a poem where at the end kids know that it is a snale they reading about. 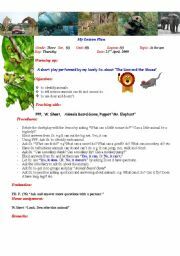 This lesson plan is simple and it contains a short play that usually entertain kids as well as adults. This song can be modified by changing the animals´ name and as well as the actions. Don´t forget to use TPR to show actions along with the song. This is for students whoes English is L2. Ss can practice simple writing. 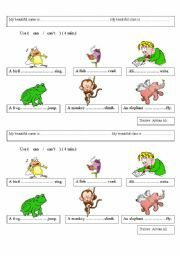 This worksheet contains adjectives of animals´ body parts. 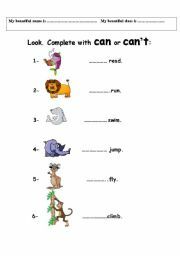 This is a simple worksheet teaching kids how to use can and can´t. Tells also actions of animals. Enjoy my design. A Time table plus timing reminder which can be adjusted to yours. This game can be palyed in a group. 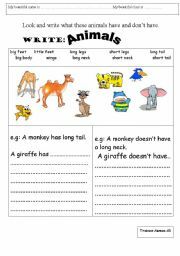 It can be adjusted to ask questions regarding the lesson such as what animal is this? what can it do? I added lines to make it easy to cut.